A kalman filter is basically a fast way to find a real value for a sensor. We could just take a ton of data and take the average and remove outliers and it probably would give you the true value you want. on timing intervals like acceleration that means inaccuracy and timing issues. //Use pathagorean theorum to get the magnetude of acceleration. //Get an inital guess at what we think the number probably is. //You can actually set this value to pretty much anything random because the kalman filter will narrow down the value very fast anyway. //This is what the error in each of our measurements probably is. //The kalman gain is a measurement of how close to the true value we probably are. //In other words it takes into account how much error we have compared to the error in the measurement. //We will use this later to make sure that new values don't change the current one as much. //At the beginning KG is larger (close to 1) and so the new data has a lot more pull on what our next estimation should be. //to a completely different value. //We add this change to our estimation to update what we think the value should be. //NOTE: Normally you don't split up the variables like this you'd just add them in one go to preserve speed and memory. //I split it up here to help explain that it is a CHANGE to the estimation when new data is added. //Now that our estimation should be more accurate we need to update our reported error as such. NAR and the San Jose put into the alliance matches together. Team rushing to make changes before the next round. During the IBC picnic, some of the members decided to play soccer. items came to the 807 (our botball room/Norman High physics room) to talk and see our workstation. This was one of the many revisions for the color sorter bot we built for seeding. Lennit, Pranav, and Andrew presenting the ROV project. Due to rule complications, NAR had to sit out while the judges made their decision. Norman Advanced went to Regionals here in Norman, Oklahoma. We competed mainly using two of our Double Elimination bots Milikan and The Denier. The Denier hopped the PVC and knocked off the opponents potato bin. Milikan drove up the ramp on our side and knocked off the poms. We made fourth place overall in Double Elimination. 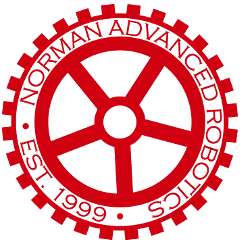 Norman Advanced Robotics competed in GCER (Global Conference on Educational Robots) from July 6th through July 10th. GCER was held in St.Augustine Florida. Teams from all over the world attended this massive conference. Norman Advanced lost in our two first games of GCER but still made a good effort. Overall the team was still happy we went because it was a great learning experience for us all!